Dual Channel – Our sensor captures both active (instantaneous) strain and peak tension strain values in a single integrated unit. Other configurations provide for the capture of peak compressive strain or dual peak (tension and compression) strains. 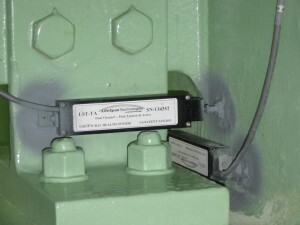 Passive – Our sensor can capture peak strain data without power. 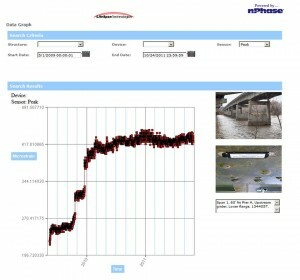 This is an ideal application for stand-alone, long term monitoring where data is only collected occasionally. Rugged – Our sensor is designed for long-term monitoring in harsh, outdoor environments and is re-usable, reducing costs. Versatile – Our sensor is designed for use in a variety of applications. Relative Movement – Out-of-Plane Bending. Our PeakStrain sensor is also available as an extended range model, capable of capturing both peak tension and compression displacements up to 95 millimeters (~3.75 inches) – all in a single housing. We can also integrate other commercially available sensing technologies, such as temperature, accelerometers, and tiltmeters, depending upon the application and need. Automatic and on-demand data acquisition. Secure data storage and archival. Our data center achieves measured reliability in excess of 99.999% – that’s less than thirty seconds of down time per month. Real-time alerts via SMS or email driven by predetermined sensor limits. Secure log-in and data observation via the Internet by structure or group of structures. Display or download selected historical data. Only licensed electricians and supervisory engineers install our systems with adherence to our strict quality assurance program and rigorous safety standards. Our system controller technology is trusted by companies around the world for use in demanding 7 x 24 environments. One of our systems in the Northeast is now operating in its ninth year; with no intervention for repair, maintenance or recalibration. And it’s still operating with the original solar-recharged batteries. Another LifeSpan system was subjected to an earthquake measuring 6.6 on the Richter scale, and continued operation with no damage. If LifeSpan’s solutions are not suited to your condition assessment application, we can help direct you to the most appropriate technology. We maintain cooperative relationships with other technology and solution providers that allow us to confidently recommend their use. So if you would appreciate guidance on identifying and selecting a condition assessment solution that is tailored to your application, please call and allow us to help you select the most appropriate technology or solution. The data generated by LifeSpan’s condition assessment solutions delivers actionable information for an owner’s asset management program while enhancing safety and providing a return on investment.